This article was written in September 2006 - In September 2007 the Ouyen to Pinnaroo line was been booked out of service indefinitely due to the track condition. By 2013 the line was open again as far as Murrayville and being used for grain trains on an as required basis only. The main feature of AWB GrainFlow Centres is their ability to load and turn around a 40 wagon train in just over two hours. This is achieved by using their ‘signature’ two large over-rail out loading bins that are a feature of each site, and at most sites through the use of a balloon loop that eliminates the need to run locomotives around the train - although there are exceptions to this track arrangement. The first site opened, Dimboola, has a loop siding that parallels the main Melbourne to Adelaide line, and the Charlton site has a long curved dead-end siding that is almost a balloon loop, but it does not connect back on itself. Pinnaroo in South Australia has another unusual arrangement, as it is the only location to load both broad and standard gauge trains. This centre is located around a kilometre from the Victorian border, alongside the railway line that links Ouyen in Victoria with Tailem Bend in South Australia. In the mid 1990’s the line from the west to the border was standardised, and although standardising was promised a number of years ago, the line from Ouyen remains broad gauge, with the break of gauge adjacent to the AWB site. A standard gauge loop siding has been constructed under the bins, with a short section of dual gauge track beyond the siding to facilitate locos running around their trains. A majority of the grain from this location is railed by GWA (formally AGR) to Port Adelaide on the standard gauge. Recently PacificNational began railing grain to Geelong on the broad gauge, utilising portable equipment to load trains on the main line to the east of the centre. 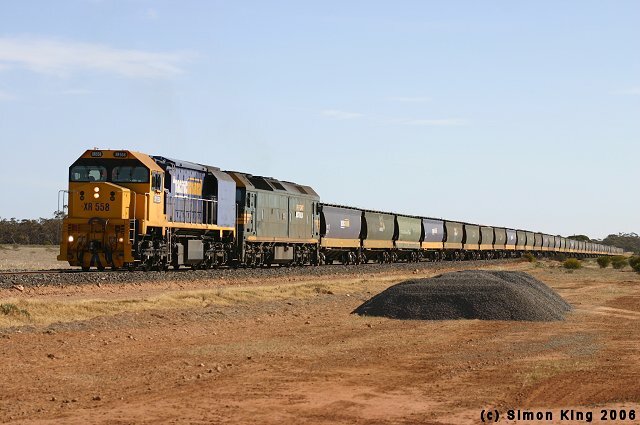 As there are no run-around facilities at this location for these trains, it is assumed that this is done at Panitya, the last siding on the Victorian side of the border, before the train is propelled back to the loading location. Trains recently have consisted of the standard XR-G combination hauling a rake of 40 wagons. When our correspondent caught up with this service on Wed.27.9.2006, it was being hauled by XR558 and G512. 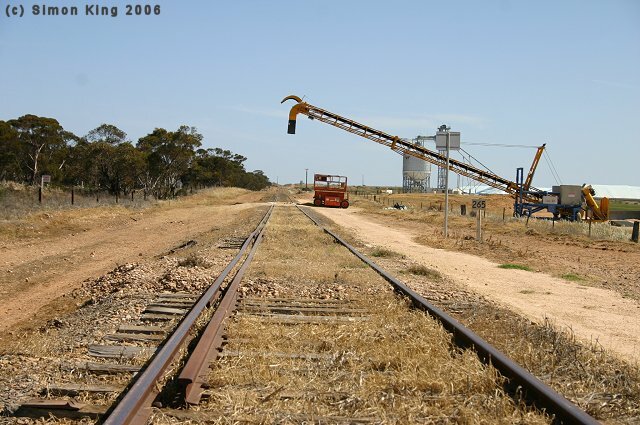 The portable grain loading equipment used to load broad gauge trains at the AWB site at Pinnaroo in South Australia. A second similar elevator is located behind the photographer, and the stanard gauge loading bins can be seen in the background. The end of the third standard gauge rail can also be seen in the foreground.